​If your travel arrangements mean you cannot check in at this time, we may be able to make alternative arrangements, but this cannot be guaranteed! Please note! We cannot cater for younger children – however, children of 14 years and older are welcome at Landhaus Lilly. In one of our rooms (sold as a ‘double/triple room with balcony‘) we have a super kingsize bed, with a large single bed. A child (or additional adult) can therefore share with 2 adults in this room type. 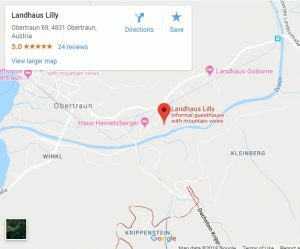 When booking on the Landhaus Lilly website, a credit card is required to secure the booking. The amount of the 1st night will be processed as a non-refundable deposit. (If the booking is made within 30 days of travel, then the total amount will be processed). If you do not have a credit card and wish to make a bank transfer for the deposit, please contact us and we will make the booking on your behalf. We will provisionally hold the space whilst the deposit is arranged. In the unfortunate event that you need to cancel your booking – please advise us immediately. Please ensure you receive a cancellation acknowledgement email – or your booking is still valid!